Two tier Galvanized double deck bike rack/bicycle rack For all types of bicycles 2 tier bike rack can accommodate all types of bicycles, such as mountain bikes and town bikes, and any bicycles can also be chained for extra security. Once placed, the bicycle is well supported by wheel channels and the back wheel is stabilised by a gutter to lock the bicycle firmly. 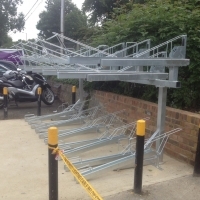 The lower rack has a sloping wheel channel, so the user does not have to bend between the levels which makes the cycle parking system simple and easy to use for all ages. This 2 tier bicycle rack is excellent for space saving as the cycle stands are compact with a centre to centre distance of around 370 mm. There is also the option to have the powder coated in any of the 192 RAL colours. Double deck bicycle rack features: 1.This double deck bicycle rack can park 2 bikes per set(one up, one down). 2.assembled in underground garage. 3.used for public place such as hosipital, school etc. 4.beautify the environment. 5.can Save space and prevention of theft. Short on time? 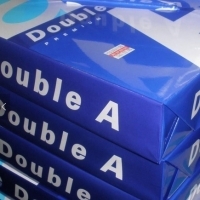 Let double-a4 sellers contact you. Sheet Size:210mm x 297mm, International Size A4 Quality: Imported 100% Virgin Wood Pulp Whiteness = 102-104%,Natural White Capability: High Speed Copying100ppm, Laser Capable,Inkjet Capable, Fax Capable. Thickness: 103-110 um Surface roughness TS ml/min: 75-175 Surface roughness BS ml/min: 100-200 Bending stiffness MD: >110 Mn Bending stiffness CD: >50 Mn CIE whiteness: 148-152 Cobb Test: 27-33 g/m2 27-33. 500 Sheets per Ream 5 Reams per Box 1560 Boxes per 20ft container(With Pallet) 1600 Boxes Per 20ft container( Without Pallet) 7800 Reams Total in one 20FCL( With Pallet). 1. Excellent image clarity & contrast. 2. High opacity and thickness. 3. High performance for both side printing/ copying. 4. Optimized smoothness on both surface. 5. Uniform toner/ ink absorption to provide good print evenness. 6. Paper dimensionally stable. Suitable for : 1. Photocopy. 2. Laser Printing. 3. Inkjet Printing. And in one 20FCL they will be packed. 500 Sheets per Ream 5 Reams per Box 1560 Boxes per 20ft container With Pallet 1600 Boxes Per 20ft container Without Pallet 7800 Reams Total in one 20FCL With Pallet 8000 Reams Total in one 20FCL Without Pallet vincentazi: 500 Sheets per Ream 5 Reams per Box 1560 Boxes per 20ft container With Pallet 1600 Boxes Per 20ft container Without Pallet 7800 Reams Total in one 20FCL With Pallet 8000 Reams Total in one 20FCL Without Pallet. We supplies any brand of A4 paper which is good for all office use. BRANDS & PRICE Paperone copier paper A4 80gr one ream ---$0.80USD paperone copier paper A3 75gr one ream----$0.80USD Double A copier paper A4 80gr one ream --$0.85USD Ik plus copy paper A4 80gr one ream------$0.85USD Xerox copier paper A4 80gr one ream ------$0.85USD HP copier paper A4 80gr one ream--------- $0.87USD Mondi Rotatrim copier paper A4 80gr one ream ------$0.80USD SPECIFICATION: Sheet Size:210mm x 297mm, International Size A4 Quality: Imported 100% Virgin Wood Pulp Whiteness = 102-104%, Natural White Capability: High Speed Copying100ppm, Laser Capable, Inkjet Capable, Fax Capable. Surface roughness TS ml/min: 75-175 Surface roughness BS ml/min: 100-200 Bending stiffness MD: >110 Mn Bending stiffness CD: >50 Mn Opacity: 95 min CIE whiteness: 167 Cobb Test: 27-33 g/m2 27-33 SUITABLE FOR: Stay flat after copying Leave no dust in the copy-machine Nice appearance-white and clean Nice touch-smooth and bulky No see through-print both sides Been developed for : Laser Printers, Ink-jet Printers, Fax Machines. And in one 20FCL they will be packed. 500 Sheets per Ream 5 Reams per Box 1560 Boxes per container(With Pallet) 1600 Boxes Per container( Without Pallet) 7800 Reams Total in one 20FCL( With Pallet) 8000 Reams Total in one 20FCL( Without Pallet). We supply of best quality A4 copy paper, we supply mostly A3 paper A4 paper in roll 80gsm,75gsm.70gsm.You can request for the specification of all the below paper.brightness 100% which is good for all office use. We supply in major international markets and we are a trusted and dependable company to deal with because we render the best of services to our customers worldwide. We are a registered enterprise here and we operate with 100% return policy and delivery is 100% assured after you agree with our company dealing tools. CIF Price Paperone copier paper A4 80gr one ream --$0.80USD Double A copier paper A4 80gr one ream -$0.79USD Ik plus paper A4 80gr one ream --$0.80USD Paperline Copier Paper A4 80gr one ream $0.78USD Xerox copier paper A4 80gr one ream -------$0.82USD FOB Prices Paperone copier paper A4 80gr one ream --$0.71USD Double A copier paper A4 80gr one ream -$0.73USD Ik plus paper A4 80gr one ream --$0.70USD Paperline Copier Paper A4 80gr one ream $0.69USD Xerox copier paper A4 80gr one ream -------$0.74USD 500 Sheets per Ream 5 Reams per Box 1560 Boxes per container(With Pallet) 1600 Boxes Per container( Without Pallet) 7800 Reams Total in one 20FCL( With Pallet) 8000 Reams Total in one 20FCL( Without Pallet) Net weight per ream -- 2,5kg Gross weight for 20fcl container 20,000kg Specification: Sheet Size:210mm x 297mm, International Size A4 Quality: Imported 100% Virgin Wood Pulp Whiteness = 102-104%, Natural White Capability: High Speed Copying100ppm, Laser Capable, Inkjet Capable, Fax Capable. Surface roughness TS ml/min: 75-175 Surface roughness BS ml/min: 100-200 Bending stiffness MD: >110 Mn Bending stiffness CD: >50 Mn Opacity: 95 min CIE whiteness: 167 Cobb Test: 27-33 g/m2 27-33 Suitable for: Stay flat after copying Leave no dust in the copy-machine Nice appearance-white and clean Nice touch-smooth and bulky No see through-print both sides Been developed for : Laser Printers, Ink-jet Printers, Fax Machines NOTE: All prices are in ( CIF ) means our company takes care of you shipping process to your port so the price includes paper cost ,shipment and insurance. *Port of loading: Port Sadankan/Port Dickson Malaysia *Payment Term: 50% advance payment to commence production by T/T.After you receive your order in your final destination India in Good condition with the Bill Of Lading and package list with the Commercial Invoice then the 60% balance payment you send to us Minimum Order Quantity: One 20FCL (20ft Container Load) Sample: Buyer pays for sample orders. To proceed on your order we will like to know if you want your order with pallet or without pallet and also kindly email back to us with your full shipping information as listed below then we will respond back with further information you will need to place your order. 1) Your Company Name: 2) Your Company Address: 3) Company Telephone Number : 4) Port of delivery: 5) Container required : 6) Paper Required: 500 Sheets per Ream 5 Reams per Box 1560 Boxes per container(With Pallet) 1600 Boxes Per container( Without Pallet) 7800 Reams Total in one 20FCL( With Pallet) 8000 Reams Total in one 20FCL( Without Pallet). Specifications: A4 Brand Name: Double A A4 Copy Paper 80gsm Media Size : Letter 8.5 x 11, International Size A4 Sheet Size:210mm x 297mm, International Size A4 Quality: Imported 100% Virgin Wood Pulp Whiteness = 102-104%, Natural White Thickness: 103-110 um Capability: High Speed Copying100ppm, Laser Capable, Inkjet Capable, Fax Capable. Copy paper 80 Gsm. Two-sided usage gives the paper sheet high opacity. Smooth paper surface makes sharp printing and copying. 500 Sheets per Ream 5 Reams per Box 1560 Boxes per container(With Pallet) 1600 Boxes Per container( Without Pallet) 7800 Reams Total in one 20FCL( With Pallet) 8000 Reams Total in one 20FCL( Without Pallet) Delivery Time. Product Description: size : 210mm x 297mm brightness : 100% whiteness : CIE 167 Thickness : 110 um Opacity : 95% Roughness : 140 ml/min Sheets/Ream : 500 sheets Reams/Box : 5 Features and Benefits : 1. Excellent image clarity & contrast. 2. High opacity and thickness. 3. High performance for both side printing/copying. 4. Optimized smoothness on both surface. 5. Uniform toner/ink absorption to provide good print evenness. 6. Paper dimensionally stable. Suitable for : 1. Photocopy. 2. Laser Printing. 3. Inkjet Printing. 500 Sheets per Ream 5 Reams per Box 1560 Boxes per container (With Pallet) 1600 Boxes Per container (Without Pallet) 7800 Reams Total in one 20FCL (With Pallet) 8000 Reams Total in one 20FCL (Without Pallet). Specifications And Loading Of Our Copier Papers: Gramage:80gsm,75gsm,70gsm Sheet Size:210mm x 297mm, International Size A4 Quality: Imported 100% Virgin Wood Pulp Whiteness:102-104% Color: Natural White Capability: High Speed Copying >100ppm, Laser. Quality / Safety Certification: Shipment: Private shipping company. Delivery Time: within 21 days Port of Loading: port Klang. Packing and stuffing details of A4 copier One packet-500 sheets (1 ream) One box-5 reams One ton-80 boxes 20'ft container-1600 boxes (20 ton) /8000 Reams. Brand Name: Double A Gramage:80gsm Sheet Size:210mm x 297mm, International Size A4 Quality: Imported 100% Virgin Wood Pulp Whiteness:102-104% Color: Natural White Capability: High Speed Copying>100ppm, Laser Capable, Inkjet Capable, Fax Capable, Low opacity, High smoothness, Extreme low jam rate 1/3500, High whiteness, Easy to use, Low dust. Packaging: 500sheets/ream, 5reams/box, 1560/1600boxes, 8,000reams = 1x20fcl. Double A4 paper in diference sizes and colours. Gramage: 80gsm, 75gsm, 70gsm Sheet Size: 210mm x 297mm, International Size A4 Quality: Imported 100% Virgin Wood Pulp Whiteness:102-104% Colour: natural white,yellow,and brown colour Capability: high speed copying >100ppm, laser Capable, inkjet capable, fax capable, low opacity, High smoothness, ext. Gramage:80gsm, 75gsm, 70gsm Sheet size:210mm x 297mm, international size a4 Quality: imported 100% virgin wood pulp Whiteness:102-104% Color: natural white Capability: high speed copying>100ppm, laser Capable, inkjet capable, fax capable, low opacity, High smoothness, extreme low jam rate 1/3500, high Whiteness, easy to use, low dust .